Section 503 of ERISA requires every employee benefit plan, in accordance with regulations of the U.S. Department of Labor (DOL), to “provide adequate notice in writing to any participant or beneficiary whose claim for benefits under the plan has been denied, setting forth the specific reasons for such denial, written in a manner calculated to be understood by the participant” and "afford a reasonable opportunity to any participant whose claim for benefits has been denied for a full and fair review by the appropriate named fiduciary of the decision denying the claim." Among the new rules is the requirement to provide notices in a culturally and linguistically appropriate manner. The final rule adopts the standards applicable to group health benefit notices under the Affordable Care Act. That is, "if a claimant's address is in a county where 10 percent or more of the population residing in that county are literate only in the same non-English language," plans are required to provide notices in a culturally and linguistically appropriate manner. The final rule was originally scheduled to apply to claims filed on or after January 1, 2018, however, DOL issued a 90-day delay extending the date to April 1, 2018. 1. Are you familiar with the American Community Survey data published by the United States Census Bureau? The circumstances under which entities are required to provide notices in a culturally and linguistically appropriate manner are determined by the American Community Survey data published by the United States Census Bureau. If you haven't already, review the survey data to identify counties that meet or exceed the above specified threshold and, subsequently, the languages in which interpreting and translation services are required by law. According to the most recent survey data, there are nearly 300 counties across 25 states and territories where at least 10 percent of the population residing in that county are literate only in the same non-English language. Those languages include Spanish, Chinese, Navajo and Tagalog. There are 25 states and territories in the United States with counties that meet or exceed the 10 percent language threshold, including: Alabama, Alaska, Arizona, Arkansas, California, Colorado, Florida, Georgia, Idaho, Illinois, Iowa Kansas, Missouri, Nebraska, Nevada, New Jersey, New Mexico, New York, North Carolina, Oklahoma, Oregon, Puerto Rico, Texas, Virginia and Washington. 2. Have you confirmed procedural requirements with any service providers who make or communicate determinations on your behalf? The final rule is applicable to entities that administer "disability benefit" claims – including plans, plan fiduciaries, insurers, third party administrators and other service provides who assist in the provision of these benefits. If you work with any service providers who make or communicate determinations for your plans, be sure to confirm their procedures are compliant with the new requirements under the final rule. 3. Do you include translated statements – clearly indicating how to access language services – with benefit denial statements? If a claimant lives in a county where at least 10 percent of the population residing in that county are literate only in the same non-English language, benefit denial notices must include a prominent statement in the relevant non-English language about the availability of language services. Plans should work with a language services provider to translate the statements, or utilize the model statements provided by DOL. To ensure translated statements are included on notices when required, make sure survey data is accessible so staff can easily determine if a claimant's address is located in a county that meets the language threshold. Alternately, plans can include translated statements on all notices to ensure compliance with the language access requirements. Spanish (Español): Para obtener asistencia en Español, llame al [insert telephone number]. Tagalog (Tagalog): Kung kailangan ninyo ang tulong sa Tagalog tumawag sa [insert telephone number]. Chinese (中文): 如果需要中文的帮助，请拨打这个号码 [insert telephone number]. Navajo (Dine): Dinek’ehgo shika at’ohwol ninisingo, kwiijigo holne’ [insert telephone number]. 4. Do you provide oral interpretation and written translation services? If a claimant's address is located in a county where at least 10 percent of the population residing in that county are literate only in the same non-English language, the plan is required to provide "a verbal customer assistance process in the non-English language." Additionally, plans are required to "provide written notices in the non-English language upon request." To comply with these requirements, plans should secure a language services partner who can provide on-demand telephone interpreting and/or video remote interpreting (VRI) services, as well as written translation services. To streamline the claims process, plans should consider translating notice templates into all required languages in advance. 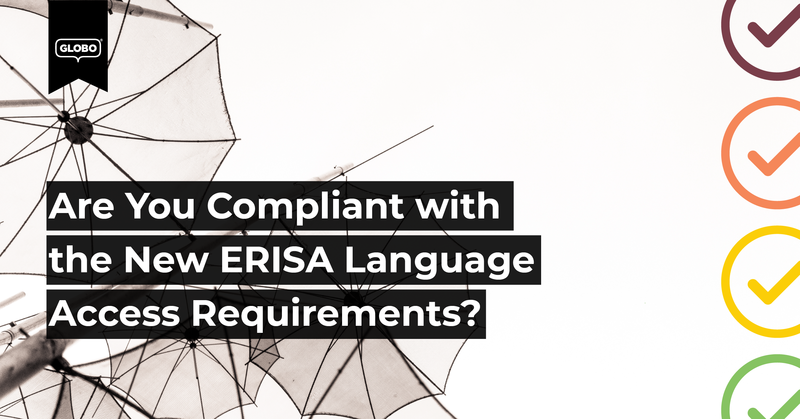 Need help complying with the new ERISA language access requirements? We're here to help!